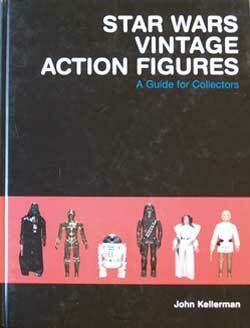 This is generally accepted as the standard work for collectors of Star Wars 3 3/4" action figures of Kenner make. Also lovingly refered to as "vintage" action figures, since these figures are among the earliest collectibles available under Star Wars flag. When I sat down to look in the book for the first time, I said "WOW!". I really didn't know there was so much to know about this subject, which in itself is only part of the insane amount of Star Wars collectibles that are available. 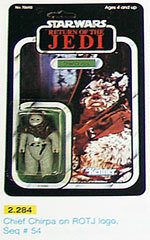 As it focuses completely on the 3 3/4" figures, you won't find any information on the Kenner 12"/15" dolls, for instance. 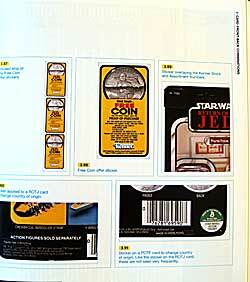 There is a section on coins, because these were added to the 3 3/4" figure packages. Coins are also highly collectible. The book is very visual in its setup. There are many, many pictures of the figures, with our without package. As you can see here, all the figures, with package variations are shown, so you can easily compare the differences. A very clear picture (much clearer than I can show you here, sorry for the murky jpg!) of each available product is shown so you can compare it with an item you already have, or one that you want to get. See that number beneath the picture (2.284 in this case)? Well, that refers to a long list that describes an indication of collectors prices. This gives you an indication of relative rareness (although price and rareness aren't necessarily 1 on 1). You need to take care, as prices can go up and down. As with fashion, there are trends in collecting, so prices may have risen or dropped as a result. The amount of detail is staggering. Here's a chapter that focuses on the differences in packaging. The page that I show here is actually zooming in on a very specialistic part of it, namely the stickers that are stuck on the package, to either promote it (the yellow sticker, I don't think you can read it, offers a free coin if you send in the proof of purchase), or to change certain information (the country of manufacturing for instance. 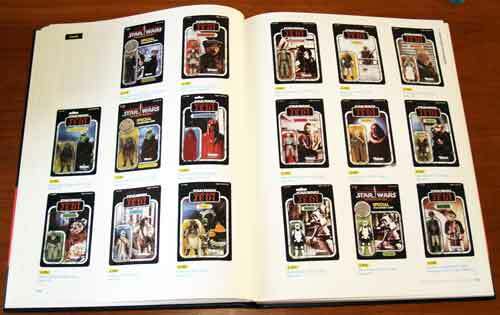 Likewise, there are chapters on other specialistic aspects of collecting the 3 3/4" Kenner Star Wars Vintage Action figures. All in all, this book is as complete as you gonna get as a standard work on the subject. There's only one downside I can think of. Supplies of this book are very limited. My copy is second hand, and we thought we did buy it 2 times before, only to be told that the item was out of stock. So you may have to spend some time searching for this book. Well worth it, btw!